Background: Resveratrol, taxol, podophyllotoxin, withanolides and their derivatives find applications in anti-cancer therapy. They are plant-derived compounds whose chemical structures and synthesis limit their natural availability and restrict a large-scale industrial production. Hence, their production by various biotechnological approaches may hold promise for a continuous and reliable mode of supply. Objective: We review process and product patents in this regard. Methods: Accordingly, we provide a general outline to search the freely accessible WIPO, EPO, USPTO and Cambia databases with several keywords and patent codes. We have tabulated both granted and filed patents from the said databases. Results and Conclusion: We retrieved ~40 patents from these databases. 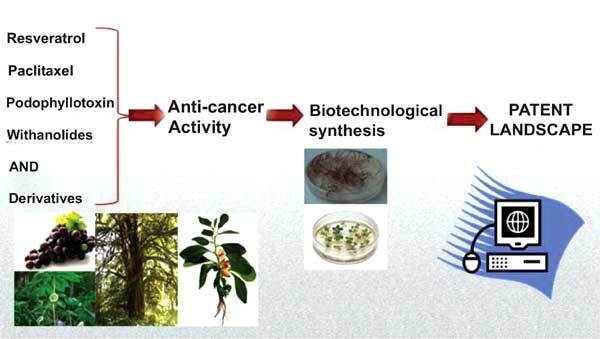 Novel biotechnological processes for production of these anticancer compounds include Agrobacterium rhizogenes-mediated hairy root culture, suspension culture, cell culture with elicitors, use of recombinant microorganisms, and bioreactors among others. The results are indicative of being both database-specific as well as queryspecific. A ten-year search window yielded 33 patents. The utility of the search strategy is discussed in the light of biotechnological developments in the field. Those who examine patent literature using similar search strategies may complement their knowledge obtained from perusal of mainstream journal resources. Patents, patent databases, patent search strategies, plant-derived anti-cancer agents, podophyllotoxin, resveratrol, taxol, withanolides.